Making an adoption decision is not always easy. The Chungs, who live in Mill Creek, WA, have an old Catahoula Leopard dog, but they were ready to add a younger dog to the family. They searched on Petfinder and finally narrowed their choice to one dog and decided to go for a meet-and-greet at Yakima Valley Pet Rescue. 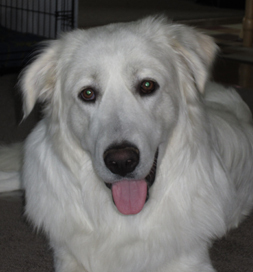 The day before the appointment, they spotted another dog that interested them as well, a Turkish Akbash/Great Pyrenees mix. Read George’s story in Cyndi’s words. At the rescue, they met George first. He was a little bigger than they expected for a four-and-a-half-month-old pup, but they were pleased that he didn’t try to bowl them over with puppy exuberance. Instead, he lay down and took a nap. They had brought their old dog along, and while George rested his eyes, they met the other dog they were considering. He came out rather aggressively. Meanwhile, a laid-back George slept through the whole episode. Call it mellow. The Chungs decided to go to lunch and think over which dog to adopt-big laid-back dog or little feisty dog. They decided on George, and they haven’t regretted it. They believe that “funny, floppy Georgie” will help them deal with the passing of their Catahoula when that time comes. He is not only a big dog but also a cuddly one – not something they expected to find in one package.